[Fig. 1] Circular to Premier Holman, 16 September 1916. From NRS 333 [3/3063.1 Circular 16/3642/89. [Fig. 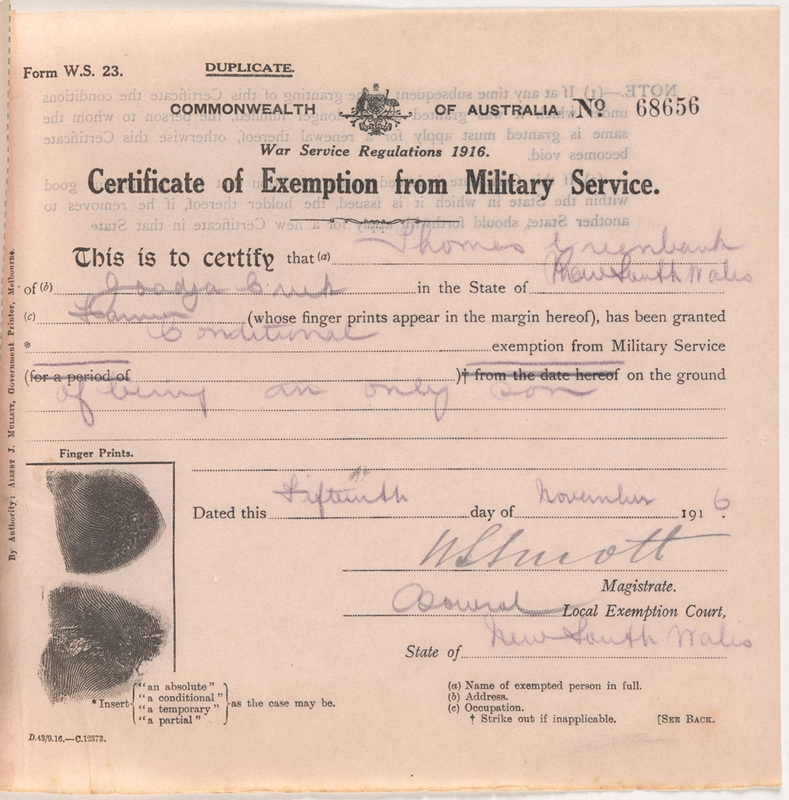 2] Minute requesting services of NSW courts, September 1916. From NRS 333 [3/3063.1 Minute 13/09/1916, p.1]. [Fig. 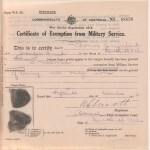 3] Minute requesting services of NSW courts, September 1916. From NRS 333 [3/3063.1 Minute 13/09/1916, p.2]. [Fig. 4] Offer of Justice Street for appeal court. From NRS 333 [3/3063.1 letter 16/5817]. [Fig. 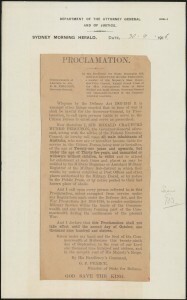 5] Proclamation, as printed in Sydney Morning Herald, 30 September 1916. From NRS 333 [3/3063.1 Proclamation]. One court was to operate in each military sub-district and deal with the “granting, renewal, variation or withdrawal of certificates of exemption”. (11) Applications for exemption were to be made to the military registrar in each of the sub-districts. While the military had the right, as laid out in War Service Regulation 17:1, to appear before the exemption court, individual men could not be represented by counsel or paid agents. (12) Each case had the right of appeal to the District Appeal Court in NSW and any further appeals were to go to the High Court of Australia. [Fig. 6] Copy of telegram sent to Premier Holman, 2 October 1916. From NRS 333 [3/3063.1, p.1]. [Fig. 7] Copy of telegram sent to Premier Holman, 2 October 1916. From NRS 333 [3/3063.1, p.1]. [Fig. 8] Circular regarding establishment of exemption courts. From NRS 333 [3/3063.1 Circular, 4 October 1916]. [Fig. 9] Certificate of exemption from military service, Thomas Greenbank. From NRS 20176, p.6. (1) Scott, Ernest, “Chapter IX: First Conscription Referendum”, Official History of Australia in the War of 1914-18, Vol. XI, 7th Ed., 1941, Sydney, Angus & Robertson, p.339. (2) State Archives New South Wales: Attorney General’s Department; NRS 333, Special bundles [3/3063.1] 16/3642/89. (3) NRS 333 [3/3063.1] 16/12678. (4) NRS 333 [3/3063.1] Circular 13 September 1916. (5) NRS 333 [3/3063.1] 16/5817. 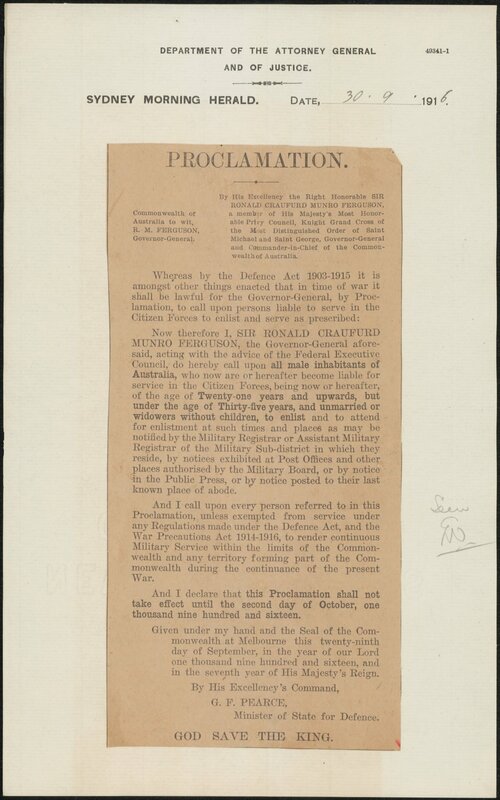 (6) NRS 333 [3/3063.1] Proclamation. (10) NRS 333 [3/3063.1] War Service Regulations 1916 (Statutory Rules 1916. No. 240). (11) NRS 333 [3/3063.1] Circular 4 Oct 1916. (12) NRS 333 [3/3063.1] War Service Regulations 1916, #17:2. (13) NRS 333 [3/3063.1] War Service Regulations 1916, #82. (15) McKernan, Michael, The Australian people and the Great War, Melbourne, Williams Collins, 1980, pp 197-98.